Like images, video can be easily embedding into your knowledge base articles. HelpSite offer multiple options for adding videos into your articles. Videos can be embedded by URL, embedded via an "embed code", or uploaded directly through our WYSIWYG article editor. For best results, we recommend you upload your videos to a video hosting site such as YouTube, Vimeo, Vidyard, or Wistia, and then to use their embed features to allow your videos to show nicely in your HelpSite articles. For many video providers (YouTube, Vimeo, Vidyard), you can simply paste the URL of the video into the spot shown in the screenshot above. 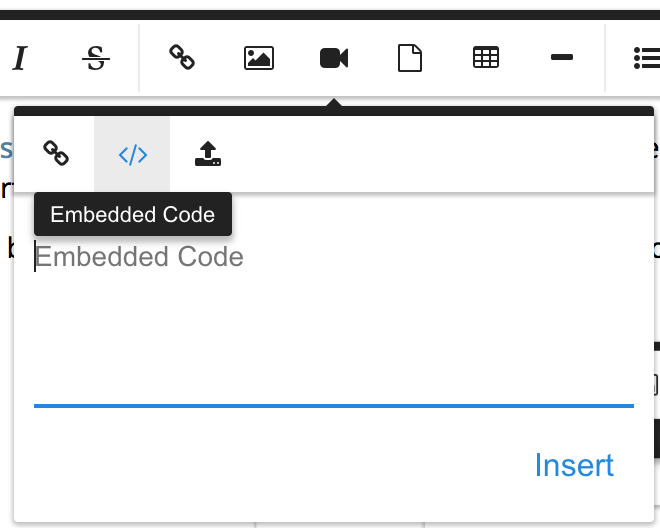 However we always recommend using an "iframe" type of embed code rather than a "script tag" embed code. For Wistia videos, you should use their Fallback (Iframe) code, as described in the Wistia documentation. Alternatively, you are able to upload videos directly to HelpSite. Our current per-file upload size restriction is 10MB and supports mp4, webm, and ogg file types. There are a few downsides to uploading videos directly to HelpSite. In addition to the restriction on file size and file types, videos uploaded directly will not have the same behind-the-scenes compression and format intelligence that professional video hosting websites do to serve the right video size and format to each user and stream it as quickly as possible. If you want to customize the way that videos are presented on your site, you can enter Code View on articles to tweak the dimensions. For example, the YouTube videos get embedded with size 640x350 by default, however you can enter code view to change those numbers. If you have any questions or need help, please do contact us!